Property Details: 4 BR, 4.5 BA Gulf-front Home with 2500+ sq. 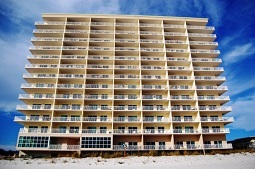 ft.
Phoenix West II condo, beachfront resort home in Orange Beach. This well upgraded, never before rented, east corner 4 bedroom condo offers it all! Enjoy stunning gulf views from your balcony and luxurious furnishings throughout the unit. Upgrades include designer furniture, granite and Corian countertops, tile throughout, tile backsplash, custom cabinets, stainless steel appliances, window treatments and much more! Do not miss your opportunity to own one of the most gorgeous units on the beach!